Richmond Heights is a suburban municipality in St. Louis County. It published its greenhouse gas inventory in 2011, using 2008 as its baseline year. They studied community emissions and emissions from government operations. The latter are a subset of the former, but municipalities study them separately because they wish to demonstrate leadership, and they have direct control over their own emissions. 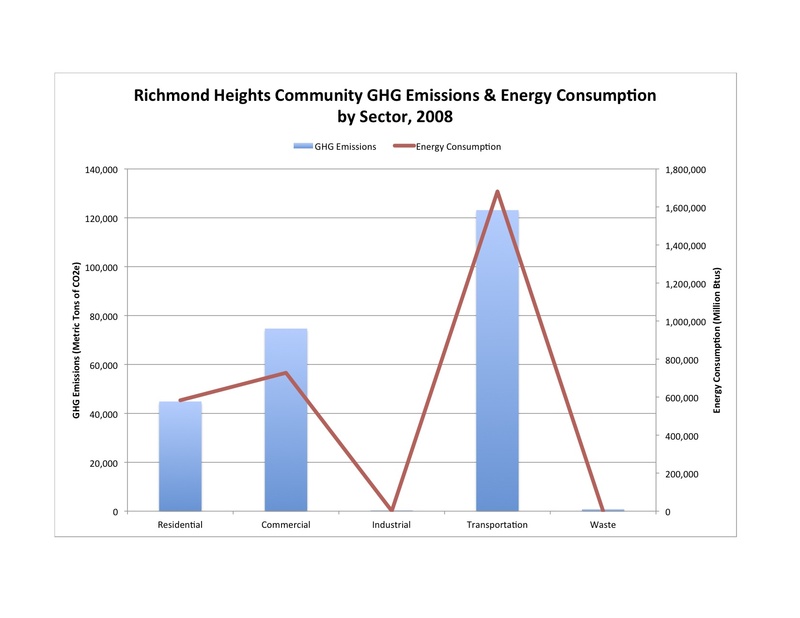 Taking the community side first: in 2008, total Richmond Heights community emissions were 243,621 metric tons of CO2e, deriving primarily from the consumption of 2,993,397 million Btu of energy. This represented 26.73 metric tons of CO2e per capita. The first graph shows community emissions and energy use by sector. Transportation accounted for the largest portions of emissions and energy consumption (>50% in each case). The commercial and residential sectors accounted for the next most. 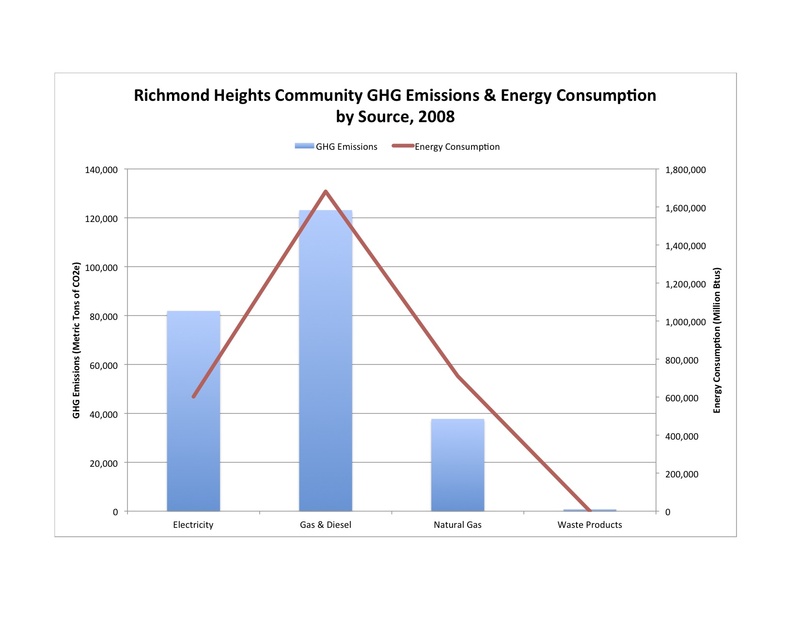 Richmond Heights has only a small industrial sector, so its contribution to emissions was small. Waste, as we have also seen in other inventories, made only a very small contribution to emissions. The next graph shows community emissions and energy consumption by source. Consumption of transportation fuels accounted for the most energy consumption and GHG emissions, with electricity second and natural gas third. In terms of GHG intensity, electricity emitted 300 pounds of CO2e per Million Btu, whereas transportation fuels emitted 161, and natural gas emitted 117. 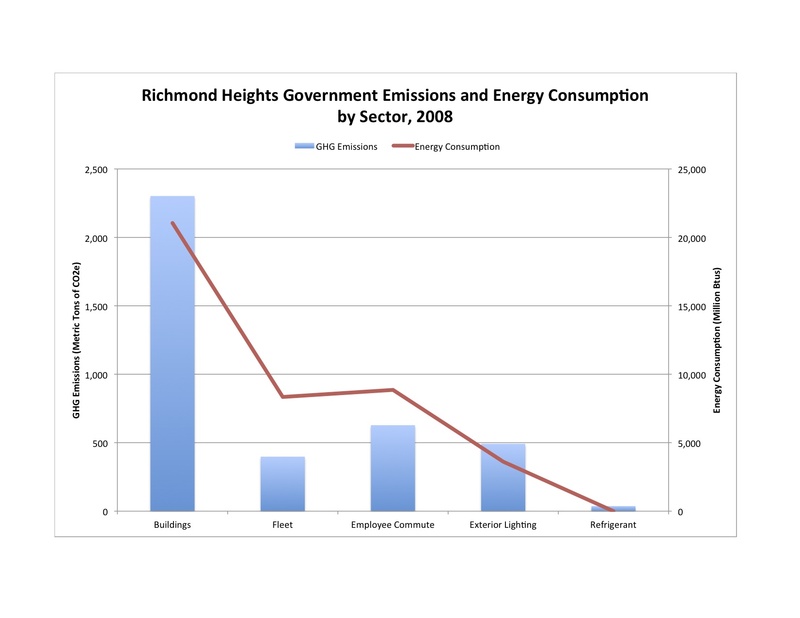 The next graph shows emissions from Richmond Heights government operations in 2005. Government buildings were by far the largest source of GHG emissions, and energy consumption. That’s a common finding. The Richmond Heights inventory then goes on to conduct an analysis of GHG emissions and energy consumption in municipal buildings by month, facility, and type of fuel. Though probably not of interest for general consumption, this sort of information should be very useful to municipal officials. The Richmond Heights GHG Inventory is available on the City of Richmond Heights website, http://www.ci.richmond.ca.us/DocumentView.aspx?DID=4279. By mogreenstats in Climate Change on 2013/01/28 .